Google Now was first introduced back in Jelly Bean 4.1 and is definitely one of the most interesting aspects of the Android OS. Simply put, it's Google's version of a personal assistant. Google Now is meant to be kinda Apple's Siri, but it learns constantly from your daily routines and it also takes cue from the Google searches you do on your computer, not just the ones on your smartphone. You can also use to voice command various aspects of your phone. 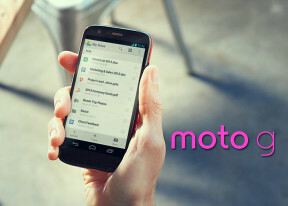 Unlike the Moto X, where the A8 chipset was always listening for the OK Google keywords to prop up Google Now, the Moto G can only access it by swiping up from the virtual Home key or through the dedicated Google Search app. Anyway, Google Now gives you short overviews of information it believes is relevant to you right now in the form of information cards. Going to work in the morning? Google Now knows this and lets you know there's a big traffic jam on your usual way to the office, so it offers you a re-route. The More section of the customization will update automatically with topics you can choose from once you've start using Google Now search capabilities. Google has also integrated Voice Actions into Now. They can handle stuff like sending messages (SMS or email), initiating a voice call, asking for directions, taking a note or opening a site. Google Now can also launch apps, check and manage your calendar and look for nearby places of interest and stuff like movie openings in theaters. You can now set your default transportation method, you favorite sports teams, company stocks you are following, places you are interested to visit and more. Once you add items you want to keep an eye on Google Now will do this instead of you. It will automatically inform you for various changes, news and updates. The Moto G comes with a Snapdragon 400 chipset with four Krait 200, Cortex-A7, cores clocked at 1.2 GHz and the Adreno 305 graphics processing unit. The phone makes use of 1 GB of RAM. The Cortex-A7 processor clocked at 1.2GHz delivers a decent mid-range performance very close to the Cortex-A9 chips, with the added benefit of having lower power consumption. BenchmarkPi focuses on the per-core performance. It evaluates how fast the processing core is and the Moto G scored just under its sibling by processor - the Xperia C - and not far behind Cortex-A9 competition. Linpack is a single or multi-threaded oriented benchmark. Here the Moto G scored just lower than the more powerful HTC One mini (boasting a Snapdragon 400 with better Krait 300 cores) and overpowered the Xperia C by a lot. Geekbench 3 is a cross-platform CPU benchmark. In it the Moto G bested the Xperia C and came close to the HTC Buttefly - not a bad score. AnTuTu 4 gauges the overall device performance instead of just the CPU. Here the Moto G was ahead of the Nexus 4 and again beat the Sony Xperia C by a strong margin. In Quadrant the Moto G scored almost double the points of the similarly-spec'd Xperia C.
Heading into GPU-intensive test territory it's time to see how the Adreno 305 inside the Moto G performs against the PowerVR SGX544 inside the Xperia C. At GLBenchrmak's 2.5 Egypt 1080p offscreen test the Adreno 305 rounded up 6 more frames per second. GLBenchmark's offscreen test shows what the GPU inside the phone can do in raw performance - not pushing the native 720p resolution, but instead a fixed 1080p one. Naturally, the Moto G was outperformed by Snapdragon 600 and 800-yellding foes as their Adreno 320 and 330 are much more potent. GLBenchmark 2.7 T-Rex offscreen also gave the nod to the Adreno 305 over the PowerVR SGX544 - the Adreno got twice the framerates. Finally, the Epic Citadel, which generates a beautiful and rich medieval scene, was the place where the PowerVR GPU was able to redeem itself by a small margin, besting the Adreno 305's otherwise good score - anything above 30 fps is stutter-free and enjoyable. In HTML 5 the Android 4.3 and Moto G duo scored a very high result leaving others, like the Samsung Galaxy S4 in the dust. Vellamo wasn't as generous as the other two but still showed the Moto G a better competitor than the Sony Xperia C.
Overall we'd say the Moto G presented stellar scores all across the board and shouldn't have any issues with providing a smooth and glitch-free smartphone experience. Now, the hardware aside, this could have much (if not most) to do with the excellent optimizations to Android 4.3 Jelly Bean provided by Google. Let's hope that when KitKat arrives, the Moto G will become even faster.